Trying to revive my blog so now added this to my phone. Trying to be more accountable for it all especially with my puppy giving me some time to craft. What I've done today and for the last four days is some work on a sock from toe up socks for everybody by Wendy d Johnson. Loving this pattern, first time doing a toe up sock so concentrating more than normal. 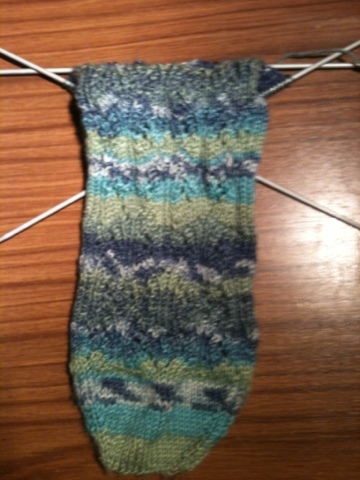 Just finished the gusset increases so will be doing the heel flap next time I work on this. Will try and blog again tomorrow with what I've done then. I've spent time making cards today just because I wanted to. I am entering both of them into a challenge. Will try and link to the challenges but it's been a long time since my last blog so hopefully I will remember. Here's my latest creation. It is very different to my usual make. I normally make very simple designs and try to keep it quite clear. This time I decided to change that. Some of the paper I used was RAK from a swap I hosted at crafts beautiful. I am entering 3 challenges with this one. The first is forever friends which is to follow the sketch this week. The 2nd is sophisicat's which is ribbon and buttons. The last challenge (but no means the least) is crafty cardmakers which is using a stamped image. I am delighted that crafty cardmakers put me in their top 3 last week with the autumn theme. This is a bookmark I made for the crafts beautiful forum but it also fits in with the crafty cardmakers challenge this week. The image is from the joanna sheen cd - jayne netley mayhew. I love the images on this cd and found this lovely squirrel which I thought was very autumnal. A quick sorry that I can't look at others posts and make any comments but blogger is telling me that I am not following anyone. These are my latest two cards. One of them will be a card for my friends wedding which is tomorrow. The other will go in the spares. I bought most of this from the craft fair I went to yesterday. I've tried to keep them very simple as that is her style she doesn't like clutter. I may change them later on when I look and add to them but I needed a break from them. This is a card I spent a long time deciding where the elements were going to go rather than my normal decide when I am ready for the next layer. This meant that the ribbon was attached behind the paper and looks better than normal and I could get the brad in the corner. This is very different to my normal Christmas card. I normally would use silver, white, red, green or gold. I've never used pink as the main colour so this was a nice change. The sketch came from Sketch Saturday and the colour was from Die Cut Dreams both of whom are looking for members of their design team. I've never entered a competition for a design team place but thought that as my cards are getting better I should give it ago as you never know what could happen. I actually made a mistake with the sketch saturday and copied the wrong sketch for the DT. Nevermind I instead entered they normal entry. Unfortuntely as I left it too late I don't have time to make a new card as it would be rushed.